Welcome to Color Hotel Style and Design Bardolino. Color Hotel in Bardolino... A creative hotel, where design, colours and unique details are harmoniously combined. The rooms, suites and interiors have been renovated according to cromotherapy, transforming this hotel into the only design hotel on Lake Garda. The Color Hotel has won HOLIDAYCHECK AWARDS 2012 & 2011, TRIPADVISOR AWARD of excellent 2012, Zoover 2012 Top Hotel, Gold best Gardalake Hotel 2011 fron Guest reviews, Condè Nast Johansens Most Excellent European Hotel Award 2013 & 2010 after been finalist 2009 and in 2008 for Design & Innovation. 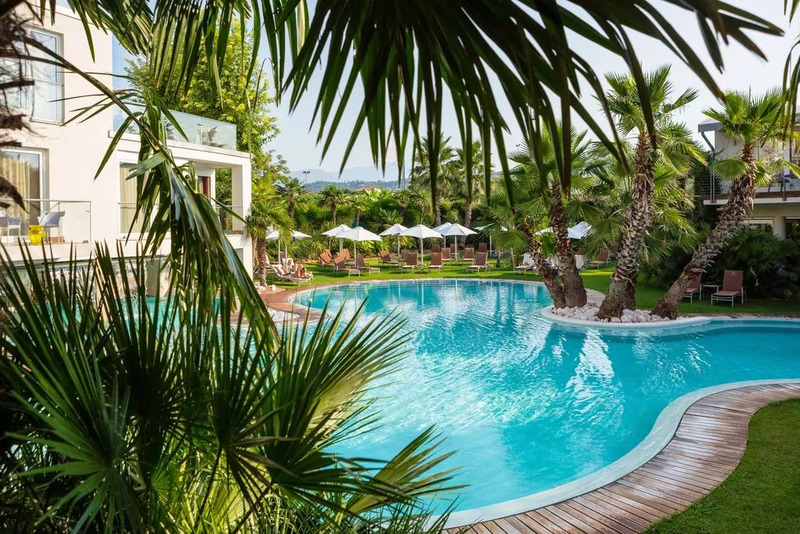 The hotel offers 6000 square-metres of lush gardens, with palm trees, olive trees, and oleanders, waterfalls and fountains, 3 swimming pools (Lagoon, Color, and the new Sun Bay). In addition to this, the hotel features a heated whirlpool (Samsara) and 3 lounge areas for your relaxation (Sunset, Samsara, and Oriental). Within easy reach of the Gardaland theme park, the hotel also offers free bike hire for you to explore Bardolino and its wonderful surroundings. A romantic holiday, honeymoon, a special occasion to be remembered, an anniversary... allow yourself an unforgettable stay at the Color Hotel. Suggestive landscapes in Bardolino red sunsets on the Garda Lake, the wonderful San Vigilio bay, the famous Giuliet e Romeo's Balcony in Verona will let you live memorable moments of romanticism. Romantic dinner with candle light, tasting the mediterranean kitchen together with our fantastic wines . A daily escape... the wonderful Venice with its romantic Gondolas. (Color Hotel Style and Design Bardolino hotels).